I don’t actually think that as a mother, wife, writer, and scholar I have it all. At least not in the way that I thought I would when I was growing up or the way that parts of the media present to us that we should or can. What I’m actually thankful for is the conversation. Today I’m the featured guest at Cheryl Stober’s wonderful project, The Having It All Project, on her website, Busy Since Birth. She asked me several questions about my life, my coping strategies, my ability to juggle work and family obligations, and my dreams for myself at age 18. My interview is here. I’ve always been fascinated by these issues. In college, in graduate school, I loved reading research studies about changes in the division of household labor, about women’s employment, about the ways that women try to balance motherhood with their own pursuits. Except now, of course, it’s more personal. And I think the conversation is changing, as women’s roles have changed and many women realize how far we’ve come and how far as a society and as individual families we still have to go. Both of their books make the sometimes very lonely struggles of day-to-day life with busy families and busy lives feel a little less lonely. And, just as important, feel less hopeless. There are so many things that we can do to make our lives better: personally as well as politically. I love these books’ message of empathy and empowerment. 2. We can all make different choices under different circumstances, but support each other at the same time. The supposed “war” between working women and stay-at-home mothers — if it ever really existed at all, except on the pages of magazines — should be over. We live in a modern world in which there are often no clear lines between working and non-working women. Women are pushing the boundaries of these previous categories, often — as O’Donnell points out — as entrepreneurs who find new ways of pursuing their own dreams. 3. We can’t rely on corporate leaders or politicians to “fix” the problems of working families; they need to pushed and we need to tell them what we need with our votes, our words, and our choices. Pick up either of these books — or better yet both of them — and know that your struggles are personal but shared. What are your challenges juggling work and family? Who are your role models? What changes do you need to make your family’s life easier? Visit the Brilliant Book Club’s Facebook page to learn more about Katrina Alcorn’s book and about our past and future book selections! And thank you to my FTSF hosts: Stephanie, Kristi, Kate, Janine. 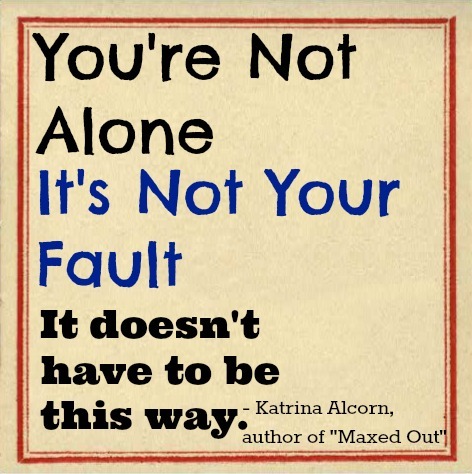 Motherlode Blog: ‘Maxed Out’ Author Thought Readers Would Critique Her Ideas. Instead, They Judged Her Choices. This is a profoundly interesting subject to me. I remember when my eldest was about 18 months old and I was still reeling from everything, I read “The Mother Dance” by Harriet Lerner, it was the first time I realized I wasn’t alone in my feelings of overwhelm. Thanks for the book recommendations! I’ll check them out! Heading over to read your interview…. Beth Teliho recently posted…Katie, Bar The Door! Read my mind, because no matter how caught up I think I am something is always pulling me in another direction. Definitely would love to read these books to see more of what these authors do have to say and thank you for sharing here today, as well as linking up with us, too. Thanks for sharing my book and Katrina’s with your readers. Women need to talk to each other more about the truth – the good and the bad. There is tremendous value in sharing with each other. Thanks so much for sharing this, Jessica. I felt SO alone when I first had my son. I’d quit my 70hour/week job while I was on maternity leave. It was one of the scariest and best things that I ever did. I don’t regret it and yet, all of my friends were working, and had hired nannies. I remember roaming the neighborhood wondering where all the new moms were. I wondered about going back to work, and whether I’d made the wrong decision. Now I know that it was the right decision for me and that my friends who stayed and hired nannies made the best decisions for them. Now, I work part time and still have a hard time balancing but certainly am in a better place knowing that I’m not alone in not being able to balance things. Heading over to read your interview now! I don’t think my wife thought her life would be this way exactly, but we are making due and living the way we want to. I stopped working when my second child was born. I didn’t plan on it when I was in college and graduate school, but it works for our family. I still think of what could have been in terms of a career, but I try to stay in the present and not dwell on what-ifs. I think one of the most important things to do is to stop dividing ourselves into different camps Whether we’re at home or at work, we’re still caring mothers. But that doesn’t change the fact that we live in very different circumstances, so we should support each other, no matter what. That’s how we’ll make changes happen. I think you are so right that the line between working and non-working moms has become blurry. As I read Maxed Out, I felt that even moms who did not work full-time (I don’t!) would be able to relate to her experience in some way. I can’t wait to go read your interview! Thanks for the book recommendations; I’ve put them on my list to read. I’m a working mom, and some of the things that have made me a happy working mom include having a short commute, a flexible, non-tradition work schedule, a supportive husband and mother, a supportive boss and company, and a great nanny. My sister advised I’d probably such as this site. Your dog once was fully appropriate. This text absolutely built my evening. Anyone cann’t think about purely how a great deal of period I’d used due to this information! Thanks a lot!